Hello dear readers!! It’s me again. How’s you going? I hope and pray everything is going well with all of you. My post this time isn’t a new post. I wrote it a year ago but has never been posted before. I hope and pray this post could be a blessing to all of us. Not many people know that I’m a melancholic woman. I have a very sensitive feeling. I’m easily moved and sad. My tears easily drop when I see something really touched my heart such as sad movie or story. Many people argue that someone who easily touched, sad, and crying is a weak people. Well, I don’t agree with this opinion. People who are sensitive or easily sad aren’t necessarily a weak person. Sadness is a thing that couldn’t be separated from our lives. No matter how good we organize our lives, still, there’re times we’ve to feel sad and should to cry. A simple example, we could be feeling sad and crying caused losing someone who we really love. My dear readers, through this post allow me to discuss about this topic. Let’s see what God’s word says about sadness. This verse was written by the most wise man who ever existed in the world, Solomon! But, this verse seemed pretty weird. 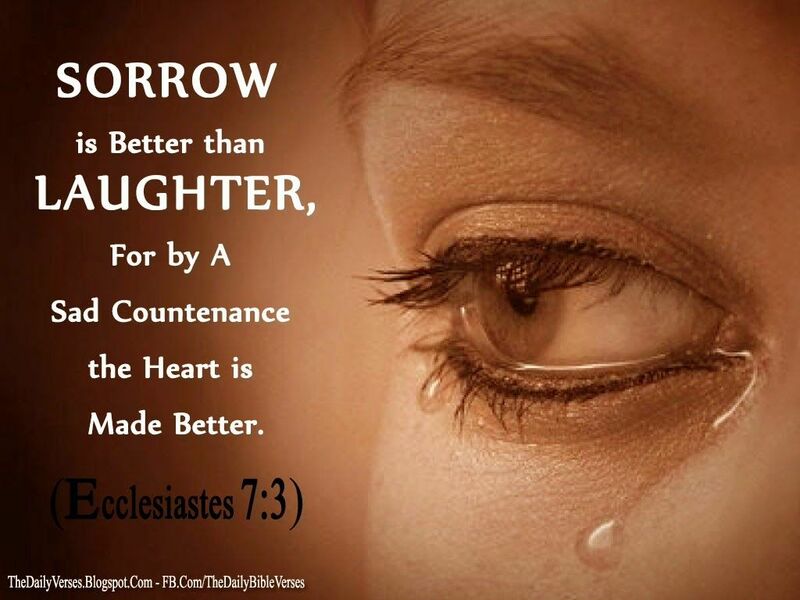 This verse as though has a meaning suggest us to be sad because will be better than to be happy. Is that true? Does God want us to be people who are often filled with sadness? Does God want us to be person who always have grim face and cheerless? Furthermore, let’s say God allows us to feel sorrow, what’s benefit for us? If any, what are they? Essentially, God doesn’t want all of us to be in a prolonged sadness. He gives so many tips and promises that can affirm, strengthen and restore us into a sense of happiness, full of peace and joy. But once again, there’re times we’ve to be sad and it isn’t wrong as long as we could handle it very soon and not make our relationship with God frays. Well, it turns out, based on my experience, there’re positive things we can learn and it all will make us become stronger, wiser and better than before. After took quite long time to ponder this verse, I finally conclude that this verse break a paradigm that we absolutely shouldn’t grieve no matter the situation and condition. So that means, although we have to live joyfully and peacefully, if one day we must be sad, just be sad because through our sadness we could learn something positive and it will makes us better in the future and finally will bring happiness to our heart. My beloved readers, let’s take a look to the next verse of Ecclesiastes 7. This following verse also looks so weird. Let’s to be honest, where we like to be, at the house of mourn or in a festive party? Of course we would prefer want to be in the party. There’s no sadness there. We just happy and enjoy the delicious foods, drinks, and other. But God’s word says the opposite. The fool is in the house of pleasure and the wise is in the house of mourning. This verse will be difficult to accept but let’s take a look why being at the house mourning is better than the party house. Let’s think about the true meaning of this verse. For an example, let say, we are in the festive birthday party. What we think about while we are in that party? I am pretty sure when in a party we don’t think about important and essential things of our lives. Probably we don’t ponder and think hard the way out of problems we face. We will dissolve in the festive spirit and we will busy involved in chat with friends or relatives. Now, in the house of mourn. Being in the house of mourn often brings the moment of reflection for us. Maybe we will think and ponder that life is short, maybe we will think about of our own lives whether we are ready if one day God calls us home to the Father’s home. Or maybe we will think weather in our lives we have pleasing God? The point is being in the house of mourn will usually remind us and bring a reflection for us and make us wiser. This’s the essential significance of the verse. David didn’t use his hard time as an excuse to be weak, to be disappointed to God, desperate, hopeless, and so on. He even felt that it was an opportunity to explore deeper about God’s statutes, learn more than before, and made it as moment to feel God’s touching extraordinarily. Many people around me often said that I’m a woman who has never experienced trouble and sadness. Oh no! That’s totally wrong! Like other women I also often sad and cry, I often experience the pressure of the hard problems, even I’ve experienced being at the lowest and hardest point in my life. But in that very bad condition I was always reminded and strengthened by that verses. There’s a time for everything. When I have to weep and cry in sorrow, that does not mean God is being cruel and having fun torturing me. Precisely for me, at that moment the Lord is forming me be strong and resilient. The hard situation teach me to be wiser and closer to God.